Do Russian-Iranian Relations Constitute a Strategic Partnership? 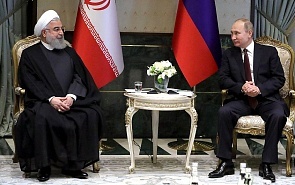 Current relations between the Russian Federation and the Islamic Republic of Iran are characterized by increased activity and dynamism, as well as expanded political, diplomatic, economic, cultural, public and other ties. All this makes perfect sense. The consistently independent foreign policies of Russia and Iran, their strong support for the universal norms of international law, as well as their staunch defense of their national interests – all this is met with vehement condemnation and growing opposition by the United States and its Western allies. The military and political pressure on Moscow and Teheran is intensifying, as is the diplomatic, sanctions and propaganda pressure. Blame for emerging crises in different parts of the world is laid on our countries, when it is Western states and their regional satellites that are responsible. Given these circumstances, there is an objective need for closer coordination of our foreign policy actions, synchronising positions on important international and regional matters, bolstering trade and economic ties, and greater efforts to intensify counterpropaganda. Regular meetings between the presidents of Russia and Iran help achieve these goals, as does the constant, close cooperation of our diplomatic and military officials, and expanded contacts in the trade and economic sphere. Russia-Iran cooperation is particularly effective in the fight against international terrorism. Whatever Western politicians and media say, Russia and Iran are now the most determined and consistent fighters of the terrorist threat. The effective military-political cooperation between the countries in order to stabilize the situation in Syria is a case in point. Defeating key ISIS units and other terrorist groups, stopping the bloodshed in most of Syria and creating favorable conditions for a political settlement process have been the main results. By actively working together, Russia and Iran made possible the Astana negotiation process, the high point of which was the Sochi summit of the presidents of Russia, Iran and Turkey. It led to the Syrian National Dialogue Congress in Sochi which adopted 12 principles of Syria’s statehood, as well as to the decision to create a committee to draft a new constitution and hold parliamentary and presidential elections based on this constitution. This process should move forward under the auspices of the UN in accordance with UN Security Council Resolution 2254. Russia and Iran attach great importance to strict compliance with the Joint Comprehensive Plan of Action for the Iranian Nuclear Program. It is an important stabilizing factor in the Middle East region and a major success of nuclear non-proliferation. President Trump’s stated plan to revise and "improve" the deal is unacceptable and dangerous. The JCPOA, which is the result of many years of painstaking international diplomacy, is based on fairly fragile compromises. Violating them will destroy the nuclear deal, dramatically escalating the situation in the Middle East region and the nuclear arms race with unpredictable ramifications. Do the above examples of foreign policy cooperation testify to a Russian-Iranian strategic partnership, or is it simply the product of fleeting political interests, a temporary tactical alliance to confront specific new threats? It appears that our cooperation on many issues remains situational and generally comes in response to emerging challenges. However, operational interaction in crisis situations is not enough to build a strategic partnership, which requires ambitious shared strategic goals, an agreed long-term program of action to resolve, or even better, to prevent possible crises, as well as complete mutual understanding and trust. We do not have such a coordinated, concrete program of action for Syria. In addition, Russia has diverse interests in the Middle East more broadly. It seeks to achieve mutual understanding and establish constructive relations with all countries of the region, including Israel and Saudi Arabia, with which Iran has strained relations at present. This is unlikely to be conducive to a strategic partnership between Russia and Iran. But a tactical alliance to counter pressure from the United States and the West alone does not make a strategic partnership. All the more so as there’s no unity on this issue in Iran itself. The liberal-reformist wing of the Iranian leadership led by President Rouhani is committed to developing trade, economic and other ties with Western countries, over the objections of the conservative part of the leadership of the Islamic Republic of Iran. Building a strategic partnership is impossible without creating strong, multifunctional infrastructure for trade and economic ties. That which exists currently is unsatisfactory. Trade between Russia and Iran remains at a low level. The work of the joint intergovernmental commission, the business council and other industry-related agencies in the government is largely ceremonial. The implementation of their decisions is dragged out even in those areas where there’s actual mutual interest in cooperation, such as energy, transport, machine building, oil and gas sector, and agriculture. The underlying reasons include various stereotypes and rules of doing business, problems with financing, insurance and banking operations, and the traditional orientation of large Iranian businesses toward Western countries in an effort to obtain investment and advanced technologies which Russia often lacks. To rectify the current situation in trade and economic relations, more than just the political will of the two countries' leaders is needed, but also greater efforts on the part of business groups and companies that are interested in cooperation between the two countries, a more vigorous search for mutually acceptable solutions to existing problems, an end to attempts to gain unilateral benefits and advantages, and willingness to diversify trade and economic ties. To create a strategic partnership, it is extremely important to improve trust and overcome historical prejudices rooted in various chapters in the history of our bilateral relations. The constant reawakening of past grievances and suspicions is not good for our relations, and only plays into the hands of those who don’t want them to improve. Let our historians and pundits deal with these matters in a calm academic setting. A more important goal is strengthening trust and mutual understanding between our countries through the development of cultural ties and people-to-people contacts. In view of the above, it is far too early to refer to Russian-Iranian relations as a strategic partnership. However, our relations have a fundamental legal basis for the successful development of multifaceted and effective interaction, which is the Treaty on the Foundations of Relations and Principles of Cooperation between the Russian Federation and the Islamic Republic of Iran concluded in 2001.